NKJV Study Bible for Kids is a wonderful study bible for kids! I love that it includes study notes to help kids dive deeper into Gods word. The features are awesome in this Bible and so helpful for kids to build a firmer foundation in the Bible. This study Bible is perfect for kids aged 8-12 and a terrific way to build up their faith. I also really love that this Bible is in full color and that it includes includes articles that are relevant to a child's daily life. 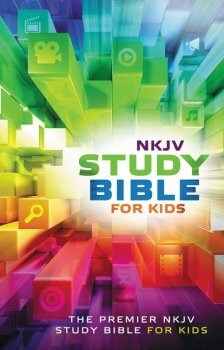 I highly recommend this NKJV Study Bible for Kids! You can find NKJV Study Bible for Kids on Amazon, Barnes and Noble and other bookstores.